Hello everyone. I am back! Sorry that I have been MIA for the past few weeks. I have been working on my new site and I have a big Wedding Exploding Box Custom order I am trying to finished. 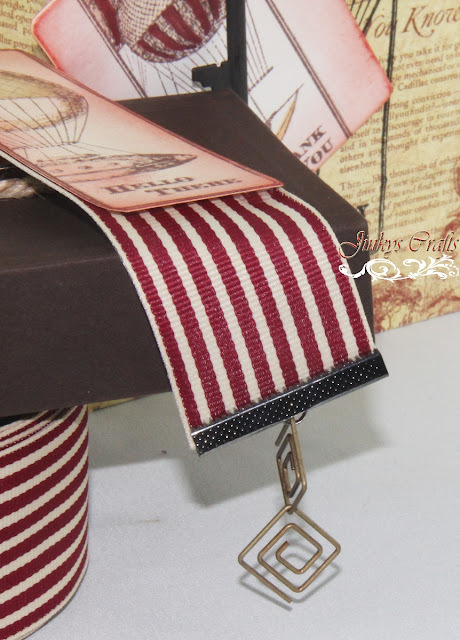 But today, I am excited to share a few projects I made recently using the Flying Airships by Hero Arts and adorned with some MayArts Ribbons. When I received these new 2012 Hero Arts Cling Stamps, I decided to make a bag and a bookmark. I used each of the Hero Arts "Flying Airship" Cling Stamp sets. For my Bag : I stamped G45 paper and heat embossed it with black embossing powder. 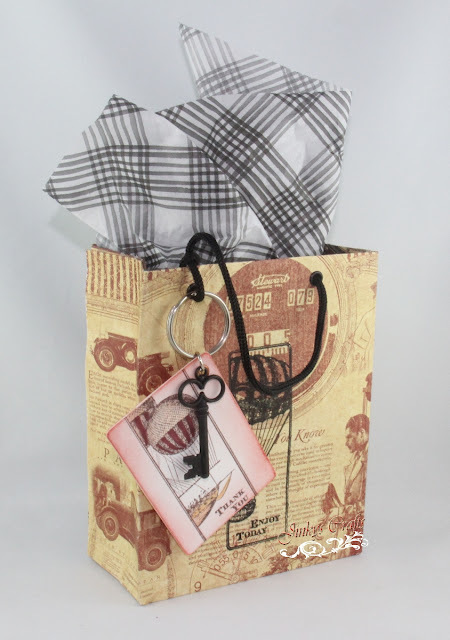 I then created a tag to adorn my bag, I stamped my chipboard with Memento Brown and colored it with markers and distressed it with "Fired Brick" Distress Ink. I used the "A Proper Gentleman" paper stack from Graphic 45. I cut enough GrosGrain MayArts Ribbon and attached ribbon clasps on both ends. Also I added hardware clips as a charms. I stamped and colored a gift tag and cut the outline so it matches the width of my ribbon. I then adhered the gift tag to my Ribbon Bookmark. This project is so easy and fast. 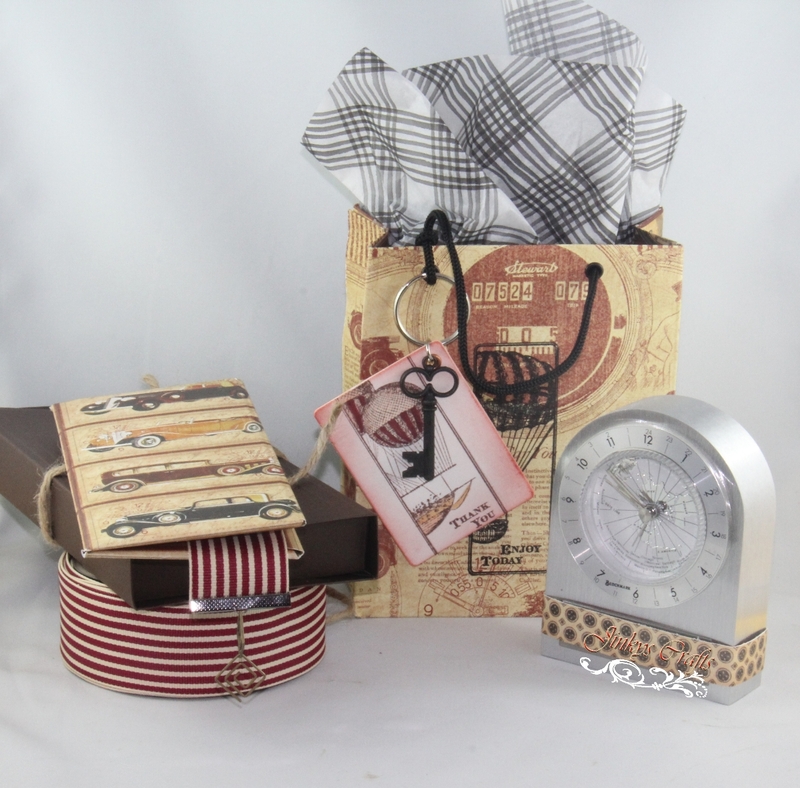 It is a great gift set for the men in your life. Thanks for stopping by and hope I inspired today. Wonderful Items Jinky!! Miss you! Such a great vintage look to these! Great work!